A popular Waterloo Region festival is in jeopardy, and its organizers say they’re worried about the fates of other events hosted by small communities. St. Agatha StrawberryFest has been cancelled this year. Festival chair Val Johnson says a lack of interest in helping organize the event means it may not return. “We did not have enough volunteers to fill the positions that we needed for the Strawberry Fest,” she says. Johnson is part of the St. Agatha Lions Club, which took over the operations of StrawberryFest in 2015 when nobody else in the community would. Last year, the festival took in enough money to donate $3,000 to local charities after paying its expenses. Johnson calls that “a drop in the bucket” to the $20,000 it used to raise annually. “When you scale things down, you get less response,” she says. Theresa Dietrich, who lives in St. Agatha and whose kids volunteered at StrawberryFest when they were teenagers, says she sees similar volunteer shortages at other events and services around the region. “Unfortunately, our volunteers aren’t there for us,” she says. Fifteen kilometres away in New Hamburg, a volunteer shortage is only of the two issues facing the Canada Day in Wilmot event. Festival chair Angie Hallman says her organization is also dealing with a shortfall in sponsorships. While many local companies were willing to come on board for Canada’s 150th birthday, bringing them back for the 151st is proving difficult. Canada Day in Wilmot also solicits donations from its patrons. Last year, the more than 7,000 people in attendance combined to raise about $2,000. Hallman says the event takes approximately $30,000 to put on. “I know times are tough for people, but … a little bit makes the day happen,” she says. This year, Canada Day in Wilmot organizers are asking for all adults who attend to donate $5. 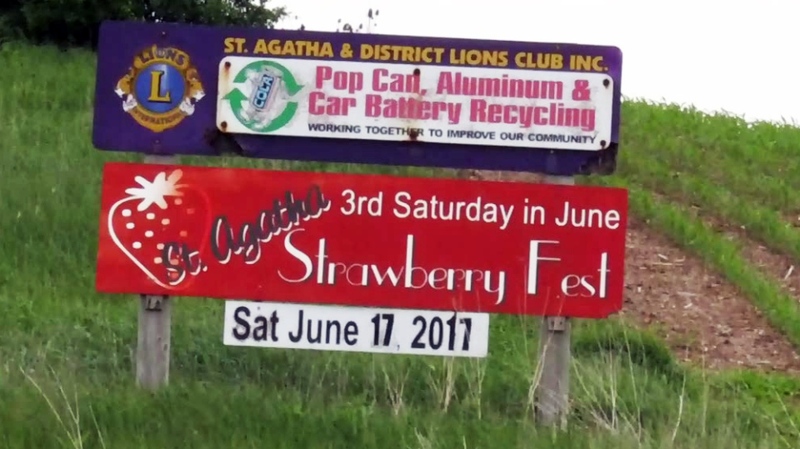 A sign advertises the 2017 edition of the St. Agatha StrawberryFest.